I know I’ve said it before but I’ll say it again; I am not a fan of peanut butter. Whenever I tell someone I don’t like peanut butter they are shocked. They don’t understand how I can be this great baker but I don’t like peanut butter. I tell them it’s simple. Whenever I make something with peanut butter in it I have my husband try it and see what he thinks. He is my peanut butter taste tester. Since I don’t eat peanut butter I don’t often bake with it. My husband does enjoy a peanut butter cookie every now and then and so do my friends at work. 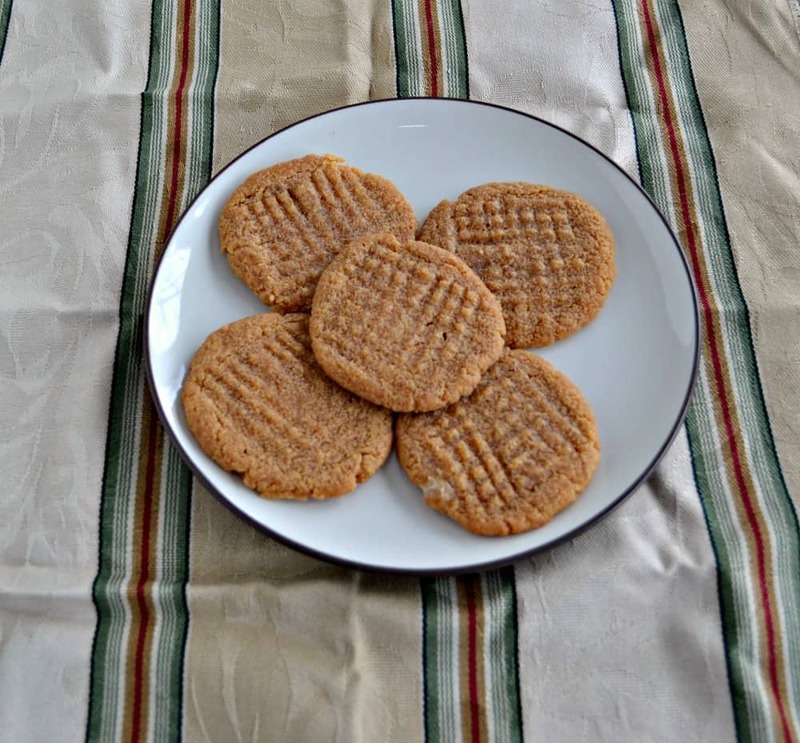 When I found a recipe for a 3 ingredient peanut butter cookie I was sold! I figured it wouldn’t take much time to make and if they worked everyone would be happy. This recipe gets bonus points for being flour free, low sugar, and gluten free. You can use sugar in this recipe and it will work just fine. 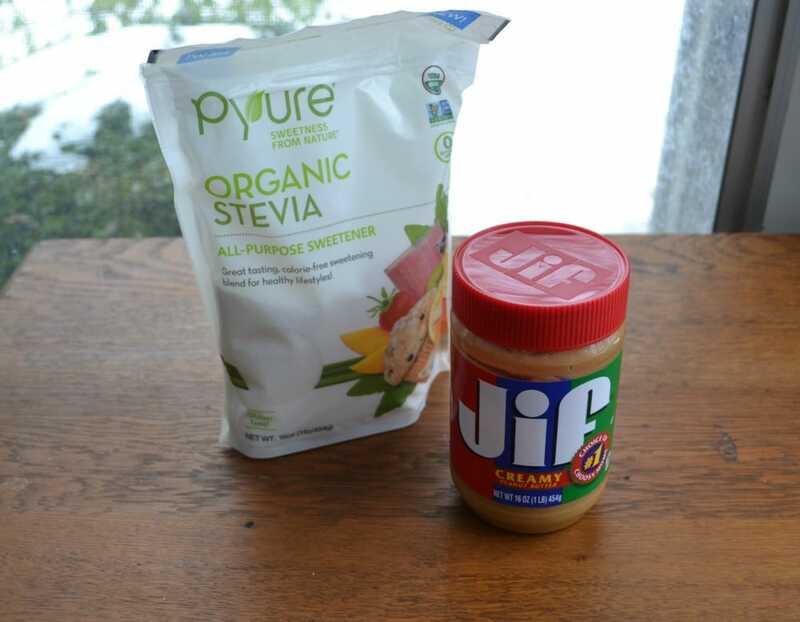 I just chose to use Pyure Stevia Bakeable Blend in order to make it very low in sugar. Pyure Bakeable Blend Stevia Sweetener measures cup for cup like sugar, without all the extra calories, allowing you to bake delicious, low-sugar treats that your family will love. The Stevia sweetener is calorie free, gluten free, and has no bitterness. It’s really good in baked goods or as a sweetener in tea. 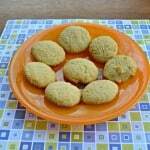 The three ingredients in these cookies are simply peanut butter, Pyure Stevia Bakeable Blend, and one egg. That’s it! I really didn’t expect this recipe to work but it did. The cookie didn’t rise very much and when I took them off of the cookie sheet they were very soft but as they cooled they firmed up. 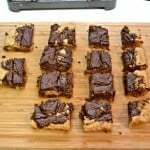 I had several people taste them for me and they were all surprised that these cookies only had 3 ingredients and were gluten free, grain free, and sugar free. These are definitely a great cookie to make whenever you don’t have a lot of time for baking. 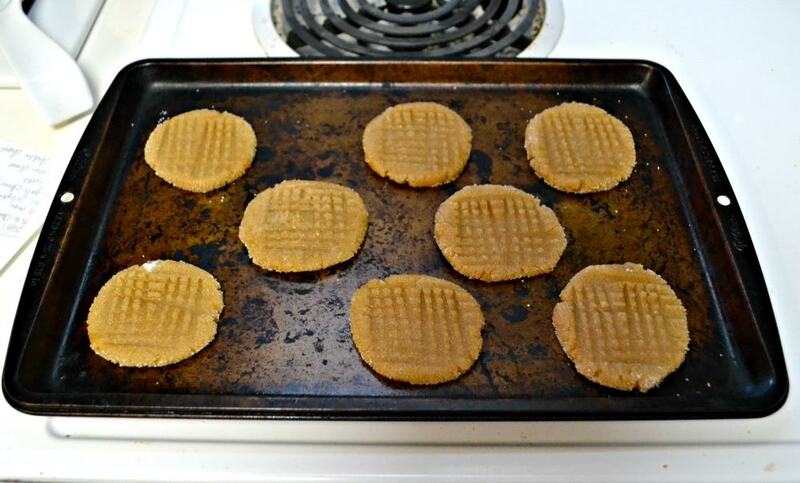 Peanut Butter Cookies that are gluten free and made with just 3 simple ingredients! In a large bowl combine the peanut butter, Stevia, and egg. Mix well until combined. Pour some additional Stevia into a small bowl. Roll the batter into one inch balls (it will be sticky) and dip into the Stevia. Place on the cookie sheet. 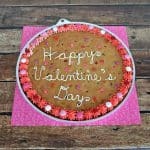 Gently press down on the cookies then use the back of a fork to create the traditional criss cross pattern. Bake for 6-8 minutes or until the just begin to brown. Allow the cookies to cool for 1 minute on the baking sheet then transfer to a wire rack to cool completely. My favorite cooking tool is my trusty KitchenAid stand mixer! My favorite tool would have to be my mixer. I love my little OXO strawberry huller! My favorite cooking to is my measuring cups because I’m so bad at guessing measurements. I love my spatula. I use it all the time. I would have to say my cast iron dutch oven is my favorite. I use it alot and would be lost without it. My favorite tool is my cast iron! My favorite tool is a spatula my grandmother gave me!! I adore our garlic peeler (weird, huh?). I love my Vitamix and my crockpot! Couldn’t live without them. My favorite kitchen tool is my hand mixer, thanks! My favorite cooking tool are my prep bowls. Getting all my ingredients prepped before I start cooking really helps to keep my kitchen clean as I cook. my faorite kitchen tool are my kitchenaid tongs! i use them for everything! I love my potato masher. Its great for all kinds of jobs! My whisk. I would be lost with it! I love my chef’s knife! My wire whisk and non slip mixing bowl are my favorite tools, next to the oven. My cast iron skillet I use it all the time. I love my new panini maker, I love cooking! Thanks for the chance! My favorite kitchen tool is my Kitchenaid mizer! My 10 inch skillet is my favorite kitchen tool! I use my whisk a lot! My favorite cooking tool is my new kitchen aid stand mixer! My favorite cooking utensil is my chopper — not quite sure if it would fall in the “utensil” category but I love it. It makes things so much easier! My favorite is my mixer from the 1950’s! My favorite kitchen tool is my whisk! My favorite cooking tool is a knife. My daughter got a Kitchen aid for Christmas and I’m loving it. She can shred chicken in 30 seconds!! I use my extra wide spatula more than anything else in my kitchen! It does so much. I love my crockpot. Actually my 2 crockpots, I use them so much, I need 2 of them. I would have to say my favorite utensils are measuring cups! I have a favorite spooula. I love my old fashioned glass juicer. My favorite kitchen tool is my Ninja Blender. I just love that thing!! My favorite kitchen tool is my metal Ekco Spatula. I love my pastry cutter! My wooden utensils. i use them for everything. My favorite cooking tool is my KitchenAid® 2-Speed Immersion Hand Blender. I just can’t kitchen without my whisk. I am weirdly attached to that little guy 🙂 I love to whisk lol. 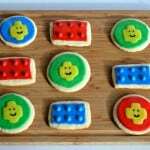 Also, I’ve been making these exact cookies for years. I find they taste 100 times better when there are choco chips added, but they are simple and great! My favorite tool is my pairing knife. I use it all the time. My santoku knife. I use it more often than anything else. My tongs! I use them for everything I cook! I turn my pan seared food with them, toss salads with them, even BBQ with them! It’s the one kitchen tool I couldn’t live without! I love my Kitchen aid mixer..